Stefan Molyneux, of Freedomain Radio, has recently had a very interesting series of interviews on “libertarian parenting”. The three guests (so far?) were me, my fellow TLS blogger Gil Guillory, and just today, David Friedman. The MP3s for the first two, and the YouTube videos for all three, are below. All three had different perspectives but were all very practical and had tons of great tips and ideas. Gil Guillory’s mentioned several books and other resources he’s found useful in the instruction of his children. There was a critique of my discussion by one “Aaron,” an “unschooling” advocate, which was debated further on the FDR boards, and discussed subsequently by Molyneux on the FDR1698 Sunday Call In Show July 18 2010. FDR1689 Libertarian Parenting – A Freedomain Radio Conversation with Stephan Kinsella – Two libertarian parents discuss how to best raise confident and freethinking children, including discipline without aggression, Montessori education, resolving conflicts and teaching skepticism and rationality. I am not exaggerating: this is what Jacob Huebert’s just-published bookLibertarianism Today is. I’ve been a libertarian for over 25 years, and have read a lot of libertarian books. I am sure I was one of Laissez Faire Books‘s biggest customers in its heyday in the 80s and 90s. Among introductions to libertarianism I’ve read are Murray Rothbard’s For A New Liberty (1st ed. 1973), David Bergland’s Libertarianism in One Lesson (1st ed. 1984), David Boaz’sLibertarianism: A Primer (1997), Charles Murray’s What It Means To Be A Libertarian (1997), Jeffrey Miron’s recentLibertarianism from A to Z (2010), and probably others I’ve forgotten. Now, among these, Rothbard’s FANL is a classic and stands out, of course. ButFANL is more of Rothbard’s own particular vision of libertarianism rather than a more comprehensive presentation of the views of the libertarian movement. And of course it is a bit dated by now, does not cover in detail topics that have risen to the fore in the intervening years (such as intellectual property, the Tea Party movement, nullification, etc.). Given the rise of the Tea Party and the expansion of the libertarian movement in the last couple decades–and the inadequacies of other introductory books (each of them, other than FANL, has various deficiencies, although some of them are excellent and most of them worth reading too)–it was high time for a good, up to date new treatment. Huebert has done just this. I read the book in manuscript form well before its publication; I readily disclose I’m friends with Huebert (he’s also a co-blogger here at TLS). I read it with growing excitement. Here, finally, was a book that covered all the major issues, and from a solidly Austrian and anarchist-informed base–one that did not reveal (or feign) ignorance of various libertarian perspectives on issues such as democracy and decentralization and drawbacks of use of electoral politics or court battles. I’ve long maintained that an appreciation of Austrian economics is essential to sound libertarian theorizing; without it, there is always something missing; with it, a more integrated and coherent libertarian perspective is possible (and frankly I don’t see how one can be an Austrian andnot a libertarian, unless one is a misanthrope). Huebert’s book exemplifies this strength in spades. He is thoroughly familiar with Austrian economics and intertwines it throughout his analysis. Let me also say, as somewhat of a specialist on IP related matters, that Huebert’s chapter on this topic is probably the single-best concise overview and explanation of the proper Austrian-libertarian case against IP, and the related libertarian debates about this matter, that I’ve ever read. The book is great for the intelligent person looking to learn more, but has enough insights to interest even seasoned libertarian intellectuals. This is one of the first books I can imagine giving to intelligent, almost-libertarian friends, who have some interest in our ideas (others include Hazlitt’sEconomics in One Lesson, Rothbard & Rockwell’s The Free Market Reader, Bastiat’s The Law, Woods’s Nullification and Meltdown; for more ideas, andlinks to some of these, see my The Greatest Libertarian Books). The book is punchy and well written, not boring; but it doesn’t talk down to the reader either. It’s got exactly the right tone, and covers all the major, modern libertarian issues–and fairly and objectively, to boot. It’s going to be very useful and popular among seasoned libertarians; the growing young generation of emerging libertarians; and with potentially interested people among the civil libertarian left and among the anti-bailout right/Tea Party types. I highly, highly recommend this wonderful book. Google Calls France A Monopoly! Well, they should, anyway–after all, “France Calls Google a Monopoly,” which is absurd. The only real monopoly is the state and monopolies it grants, not private companies that have no extra-market power. Imagine a state adopting the motto, “Don’t Be Evil.” You could use it to strike down most of its laws! What would a free market in legal services be like? I am always tempted to give the honest and accurate response to this challenge, which is that to ask the question is to miss the point. … It is possible to describe what a free market in shoes would be like because we have one. But such a description is merely an observation of the current state of a functioning market, not a projection of how human beings would organize themselves to supply a currently non-marketed good. To demand that an advocate of free market law (or Socrates of Monosizea, for that matter) describe in advance how markets would supply legal services (or shoes) is to issue an impossible challenge. With the advent of state IP legislation, the state has interrupted and preempted whatever other customs, business arrangements, contractual regimes and practices, and so on, that would no doubt have arisen in its absence. So it’s natural for those new to the anti-IP idea to be a bit nervous about replacing the current flawed IP system with … a vacuum. It’s natural for them to wonder, well what would occur in its absence? As I noted, the reason we are not sure is the state has snuffed them out. This is similar to the FCC which preempted and monopolized the field of property rights in airwaves just as they were starting to develop in the common law; now people are used to the idea of the state regulating and parceling out airwave or spectrum rights and might imagine there would be chaos if the FCC were abolished (for more on this see David Kelley & Roger Donway‘s 1985 monograph Laissez Parler: Freedom in the Electronic Media, as discussed in my post Why Airwaves (Electromagnetic Spectra) Are (Arguably) Property). How would content creators be rewarded in an IP-free market? Some answers may be found in Boldrin and Levine’s Against Intellectual Monopoly (see Jeff Tucker’s A Book that Changes Everything). Inventors invent to be first to market. Academics publish articles or books to enhance their reputation and increase their employability. (As author Cory Doctorow observes, “For me — for pretty much every writer — the big problem isn’t piracy, it’s obscurity.”) Singers or musicians might give away recorded albums for free to gin up concert sales. Pharmaceutical companies, freed of enormous tax and regulatory (including the FDA) burdens would have much less need of a patent monopoly to help make up for these costs; and could profit from being first to market and reputation (notice that Tylenol still sells for about twice the price of the generics right next to it on the shelf?). Perfume and fashion thrive without IP. Open source software is plugging along. And so on. What about movies, or novels for profit? Various ideas have cropped up. Perhaps the author releases his first book for free to get a fan base; then withholds the sequel until a certain number of fans pledge to pay for the book. As for movies, perhaps they are released first in DRM format to elegant movie houses, before being released on DVD or digitally. (In Against Intellectual Property, n.67, I related the example of how drive in movie theaters, “faced with the prospect of free riders peering over the walls, installed—at considerable expense—individual speakers for each car, thus rendering the publicly available visual part of the movie of little interest.”) It is basically the task of entrepreneurship to figure out how to make a profit off of a given service, given the realities of costs of exclusion, ease of cheap substitutes, and so on. At the Property and Freedom Society conference in Turkey last June, someone asked me just these questions after my IP talk. One thing I suggested–brainstorming in the lobby–was that a novelist could perhaps sell his “endorsement” and consulting to a given movie version of his novel. Why would the movie studio pay him? Well if there are two or three movie versions of a novel, the version on which the author consulted and gives his “seal of approval” would likely be more attractive to his fans. So everyone benefits: the fans have an indication of which movie to see; the movie studio makes more money; and the author gets a royalty and consulting fee. Maybe he sold the book for free simply to have a chance to consult on and endorse a movie version. Who knows? The Creator-Endorsed Mark is a logo that a distributor can use to indicate that a work is distributed in a way that its creator endorses — typically, by the distributor sharing some of the profits with the creator. … For example, the creator might say that anyone who shares any profits at all with them can use the generic “proceeds support” version of the mark. … Furthermore, a creator might grant permission to anyone who shares a certain percentage of their profits to use a “percentage” version of the mark, as long as it does not exceed the actual percentage shared. For example, a distributor sharing 25% of profits could use this mark. Because there is no copyright (or it’s disclaimed, say) someone could distribute the work without the author’s permission and without the CE mark, but presumably CE-endorsed works would sell better as fans and customers prefer to buy from distributors who support the artist. has a creator, it would be Karl Fogel of QuestionCopyright.org. He wrote about the “Author-Endorsed Mark” well before I hit the Free Culture scene. When Fogel and I collaborated on the Free release of Sita Sings the Blues, we changed “Author-Endorsed” to “Creator-Endorsed” (… the thinking was “creator” includes visual artists, musicians, and others as well as authors of texts). I designed the logo, and we put the mark in action on “Sita” DVDs, CDs, and other merchandise. In any case, Fogel’s and Paley’s intellectual innovation here should be strongly considered by those seeking a moral way to profit off of creative content. Update 3: Smith has written a reply of sorts: Little Criminals: The Context of Consent; Seth Cohn provided a good dissection of it in a comment on FreeKeene.com. I have to say I cannot discern an argument at all in Smith’s piece. He simply assumes that what you create is your property, and throws in a few utilitarian considerations. Update 4: See also my post Replies to Neil Schulman and Neil Smith re IP. Update 5: FreeTalkLive’s July 19 show discussed Smith’s Little Criminals: The Context of Consent (start at 1:02:35) and also, in response to a call-in by Todd Andrew Barnett, on the July 21 show (start at 50:41); and again, on the July 23 show (28:14) and on the July 25 show (15:10). Update 6: Smith has posted a couple of anti-IP articles on his site, The Libertarian Enterprise, Seth Cohn’s A response to “Little Criminals” with a challenge… and Theodore Minick’s IP is dead, Long Live Media! The Supreme Court handed down this term’s final four decisions today: Christian Legal Society Chapter v. Martinez, on public university limitations on a Christian student group’s rights of association; the McDonald v. Chicago case incorporating the Heller gun decision against the states (Huebert’s discusssion); Free Enterprise Fund v. Public Co. Oversight Bd. (a Sarbanes-Oxley decision); and Bilski v. Doll, a much-anticipated patent case. Patent law is mind numbingly arcane, technical, and boring, so let me simplify as much as possible. This case was about what the legal test should be to determine whether certain processes can be possibly eligible for patent protection. For typical practical technical or industrial processes, it’s not a difficult question. But for “business-related” methods, such as the one here–which had to do a way for commodities buyers and sellers in the energy market to hedge against the risk of price changes by following a certain mathematical formula–the question gets trickier. Courts are leery of opening the door all the way because then we’d be swamped in even more ridiculous patents than we are now (such as the attempt by Dustin Stamper, President Bush’s Top Economist, to secure a patent regarding an application for a System And Method For Multi-State Tax Analysis, which claims “a method, comprising: creating one or more alternate entity structures based on a base entity structure, the base entity structure comprising one or more entities; determining a tax liability for each alternate entity structure and the base entity structure; and generating a result based on comparing each of the determined tax liabilities”). The point is, the judges here are merely interpreting arbitrary words of an artificial law, a statute–a written down edict of the legislature, a bunch of words that have no inner harmony, no guarantee of consistency, no relationship to justice. So you can’t really criticize the courts too much for how they construe these legal abominations. Back to Bilski. So the Court rejected the CAFC’s holding that the “machine-or-transformation test” was thesole test for determining patent eligibility. They said that while this test “may be a useful and important clue or investigative tool, it is not the sole test for deciding whether an invention is a patent-eligible ‘process.’”But they had to find a way to strike down this patent, so they did so based on an older test, one that just said you can’t patent “abstract ideas.” So, the Court was able to reject the narrow test of the CAFC, without having to allow this business method patent. But they wanted to encourage the CAFC that they could try to find yet other ways to limit questionable method patents: “In disapproving an exclusive machine-or-transformation test, we by no means foreclose the Federal Circuit’s development of other limiting criteria that further the purposes of the Patent Act and are not inconsistent with its text.” I.e., they punted: you guys figure out a better way to shut the doors a bit more, consistent with this statute. So what do we have: we have a very slight narrowing of patent eligibility by re-use of an old “abstract idea” test; a rejection of the more bright-line, narrower but unstatutory test of the CAFC; and more legaluncertainty. And while the patent bar will use the slightest modification of patent law to cry that the sky is falling, it’s not. Unfortunately. In addition to the Smith-Marx connection, It is also my view that Locke’s idea that homesteading rests on “ownership” of labor is mistaken–it’s an unnecessary step; you can show Lockean homesteading is justified without making the crankish assumption that you own your labor. But the assumption that you can own your labor, I believe, has led to (or supports) modern mistakes like reputation rights, intellectual property, and the like–it’s led to an overemphasis on the right to “own” whatever you “create” by your labor, without first asking whether the thing created/labored upon is ownable in the first place (see, e.g,. my posts Objectivists: “All Property is Intellectual Property”, Rand on IP, Owning “Values”, and “Rearrangement Rights”, and Thoughts on Intellectual Property, Scarcity, Labor-ownership, Metaphors, and Lockean Homesteading). I believe I read long ago some intriguing analysis linking legal positivism with logical positivism–showing the commonalities and interrelationships. But I’ve long lost this reference and have not been able to find exactly what I’m looking for. If anyone knows of any good discussions about the links between legal positivism and logical positivism, I’d appreciate you sharing it. As above, if anyone has any suggested references discussing this connection, please note or discuss in the comments. At present, when any doubt arises in any particular case as to what the true rule of the unwritten [i.e., judge-found, common-law developed] law is, it is at once assumed that the rule most in accordance with justice and sound policy is the one which must be declared to be the law. The search is for that rule. The appeal is squarely made to the highest considerations of morality and justice. These are the rallying points of the struggle. The contention is ennobling and beneficial to the advocates, to the judges, to the parties, to the auditors, and so indirectly to the whole community. The decision then made records another step in the advance of human reason towards that perfection after which it forever aspires. But when the law is conceded to be written down in a statute, and the only question is what the statute means, a contention unspeakably inferior is substituted. The dispute is about words. The question of what is right or wrong, just or unjust, is irrelevant and out of place.The only question is what has been written. What a wretched exchange for the manly encounter upon the elevated plane of principle! recent CNET video on “Intellectual property rights vs. journalism” shows a Stanford University’s Innovation Journalism conference on June 7, with a panel discussion by various mainstreamers discussing the quesion “Is intellectual property protection a threat to journalism?” The lack of libertarian principle and sound economics has these commentators floundering as they discuss various cases where IP infringes free speech and freedom of the press. Lacking any principled approach they retreat to legal positivism, talking about how the Constitution protects both freedom of the press and speech as well as IP rights, so some “balance” must be made. Without Austrian economics and libertarian principle, even well-intentioned people, who sense that something is wrong, are helpless before the state’s propaganda and onslaught of legal positivism. Many academics toil a thankless life, striving for truth amid a sea of fallacies and inaccuracies. Some who do this with mediocrity are ignored. Those who do it well are often subject to intense criticism and ridicule. A select few rise to the challenge, and with conviction, carry forward – ever aiming to convince the masses that their truthful pursuit is right. Of this miniscule number of individuals, only a handful may ever reach the point where their peers recognize them for their insights, and reward their toils accordingly. Hans-Hermann Hoppe is one such individual. … The collection of scholars who have come together to pay their respects reads like a veritable “who’s who” list of the world’s leading political philosophers. Hülsmann and Kinsella note in their brief introduction that after Murray Rothbard’s untimely death in 1995, Hoppe assumed a role of “uncontested leadership” among the Austro-libertarian scholars. The scope of this leadership is evident as one reads the contributions offered by his admirers in the following pages. … The thirty-five contributions to his Festschrift … show the far-reaching effects that his writ- ings have had. In many diverse fields we can see the torch of Hoppean economics and political philosophy carried on. The quality of the contributions is outstanding and should result in this work being highly read and influential in furthering the Austro-libertarian research paradigm. In many ways, it is unfortunate that honors such as a Festschrift come along only once a lifetime for an individual. With so many contributions currently progressing and many significant works yet to come, it will be interesting to see our Herr Professor Doktor’s sphere of influence grow as the years continue. Until such a time, the present work is a succinct place to read the scope and influence of Hans-Hermann Hoppe’s works over his lifetime; let’s hope that more is to follow in the future. 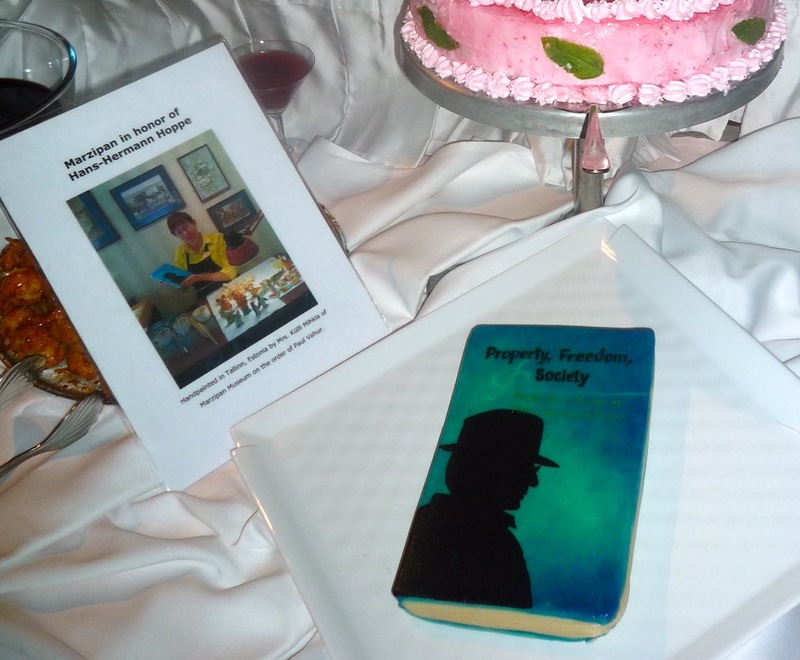 As a piece of Festschrift trivia, as I noted in Bodrum Days and Nights: The Fifth Annual Meeting of the Property and Freedom Society: A Partial Report, at the recent Property and Freedom Society conference in Bodrum, Turkey, a guest presented a festschrift-cake he had had made in Estonia, entitled “Property, Freedom, and Society: Marzipan in Honor of Hans-Hermann Hoppe,” which was served as part of the dessert at the closing banquet. Earlier this month, I spoke at the Fifth Annual Meeting of the Property and Freedom Society in Bodrum, Turkey (see my Bodrum Days and Nights: The Fifth Annual Meeting of the Property and Freedom Society: A Partial Report). My topic was “Ideas are Free: The Case Against Intellectual Property,” though a better title might be something like “Ideas Are Not Property: The Libertarian IP Mistake and the Structure of Human Action.” It is now available in audio and video. The other speeches (see the Program) are being uploaded and will be linked here. PFS 2010 – Stephan Kinsella, Ideas are Free: The Case Against Intellectual Property Rights from Sean Gabb onVimeo.